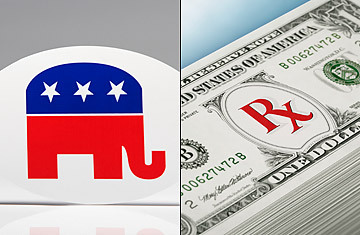 House Republicans on Wednesday introduced their official alternative health-care-reform plan. Well, kind of. It's not the official alternative, but it has the support of the leadership. And sure, some leaders may support other alternative bills out there, but this one also has the support of the top Republicans on the relevant committees. Oh, wait  some of them may also support other bills. But in any case, all this should remind you that the GOP does really stand for something. Let's leave aside for the moment that this plan was a four-page exercise in public relations that left out how many of the 47 million uninsured Americans would be covered, how it would be paid for or even how much it would cost. The plan  and the four others introduced by Republicans in the House and five more in the Senate  is indicative of how the GOP is handling Democratic efforts to pass universal health care: death by a thousand paper cuts. "There'll be lots of Republican plans. I think that many of our members will want to be part of this plan," Representative Roy Blunt, a Missouri Republican in charge of the House Republican Health Care Solutions Group, said upon leaving Wednesday's press conference. "And there will be Republicans who sponsor this plan and who sponsor other plans that have slightly different ideas than this plan. On health care, we are truly the party that brings the ideas to the table that are much more innovative than the government taking over the health-care system." Ideas, sure, but details  not so much. This proposal, similar to a plan introduced in May by GOP Representatives Mark Kirk and Charlie Dent, would allow small businesses, states, associations and other organizations to pool their health insurance across state lines to help bring down costs. Kirk and a group of 34 moderate Republicans this week also introduced another alternative, which would allow those not insured by their employers to deduct the cost of their insurance policies from their income taxes. In May, Representative Paul Ryan, together with Representative Devin Nunes, introduced a bill called the Patients' Choice Act, which would essentially 1) redirect much of the money that goes into Medicaid to individuals to buy health savings accounts, 2) encourage high-deductible health insurance and 3) tax employee health benefits in a manner similar to what Senator John McCain proposed during the presidential election. That bill was akin to what Ryan proposed in the 2010 GOP budget alternative. Ryan shares sponsorship of the Patients' Choice Act with Senators Tom Coburn and Richard Burr. Also in the Senate is the Wyden-Bennett plan, a rare truly bipartisan bill that enjoys the support of several GOP sponsors, including Senator Bob Bennett, a Utah Republican. That plan, co-sponsored by Oregon Democrat Ron Wyden, would mandate that everyone purchase health insurance and be able to prove it  similar to auto insurance  and would subsidize those who can't afford it. It envisions ultimately reducing the rolls of those on employer-based health insurance on the presumption that most people would sign up for state-based private plans, which would be able to pool more effectively to keep down costs. It's the only plan that's been scored by the Congressional Budget Office as deficit neutral, and it lays out a more comprehensive approach. Senator Judd Gregg, the top Republican on the Budget Committee, also recently laid out a proposal that expands private health-insurance coverage; and Senator Mike Enzi, the top Republican on the Senate Health, Education, Labor and Pensions Committee, has said he too is working on legislation. Some of the bills aren't actually meant to be comprehensive. The patients' bill introduced by Senator Mitch McConnell and Senator Jon Kyl would simply bar the government from using comparative-effectiveness research to reduce costs in Medicare and Medicaid; the two say such approaches are used in socialized health systems. If you're feeling dizzy, that's the point. Republicans have been unified in their opposition to Obama's stimulus and his budget, but they know they risk being permanently dubbed the Party of No. Nor can they take the tack Democrats have taken in the Social Security debate: health care isn't working just fine as it is. But their solution  to simply overwhelm Washington with different ideas they know will never pass  has its downsides. "Competing ideas or plans look weak and show a divided opposition. Since most of what the minority members do is criticize the majority ideas, they look like a party of no even if they have some ideas of their own," says Norm Ornstein, a scholar at the American Enterprise Institute. "The early all-out opposition of Republicans to the stimulus plan, and the exultation that House Republicans showed when they voted unanimously against it, created this image of a party of no, which is hard to shake." What's more, all their ideas and competing plans may be creating a bit of sensory overload. "I started reading a couple, three of the Republican plans, but frankly, there's only so much time in the day," says Senate Finance Committee chairman Max Baucus, who is authoring one of the leading Democratic plans. "I've started to spend more time with Republicans who are amenable to health-care reform and say to them, 'What would you like? What do you think?' That kind of thing. That's how I use my time. What's viable  that has a higher priority."